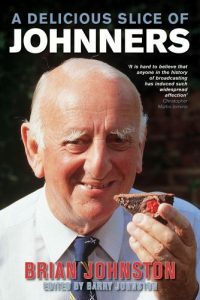 In 1993 Brian Johnston embarked on a nationwide tour of his one man show An Evening with Johnners. The tour was a sell-out and a recording of one of the shows became a number one bestseller and was awarded a Gold Disc. This book was first published in 1996 and contains all the material from the original recording as well as additional stories from Brian’s final tour before he died in January 1994. Brian’s skill and warmth as a master raconteur shine through on every page as he recalls his early years at Eton and Oxford, his war service with the Grenadier Guards, and his remarkable broadcasting career at the BBC. There are hundreds of hilarious memories, stories and anecdotes, and he also describes the famous ‘leg-over’ incident. 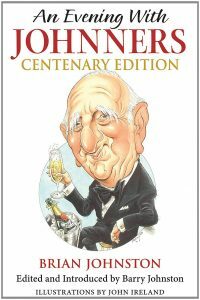 This special centenary edition has been updated by the editor, Brian’s eldest son Barry Johnston, and includes new illustrations by John Ireland. A bumper collection of the funniest anecdotes, jokes and stories from cricket’s best-loved personalities proves that cricket is a funny game – even when rain stops play! 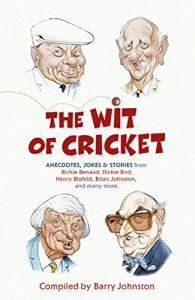 Now you can read not only the most popular stories by five of the game’s all-time great characters – Richie Benaud, Dickie Bird, Henry Blofeld, Brian Johnston and Fred Trueman – but also the humour of modern players including Michael Atherton, Andrew Flintoff, Darren Gough, Kevin Pietersen, Shane Warne and many others. Here are dozens of hilarious anecdotes about legendary Test cricketers such as Ian Botham, Geoffrey Boycott, Denis Compton, Michael Holding and Merv Hughes – not to mention broadcasting gaffes, sledging, short-sighted umpires and the first male streaker at Lord’s! 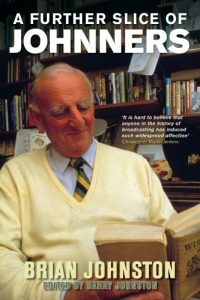 With his schoolboy humour and distinctive, cheerful voice, ‘Johnners’ was a friend to millions of radio listeners and when he died in 1994 at the age of 81, the Daily Telegraph described him as ‘the greatest natural broadcaster of them all’. Born in 1912, Brian had an idyllic childhood in Hertfordshire until he was ten years old, when his father drowned on a seaside holiday. After going to Eton and Oxford he wanted to be an actor, but was persuaded to join the family coffee business in the City. When war broke out he served with the 2nd Battalion Grenadier Guards in Normandy and was awarded the Military Cross. After being demobbed Brian joined the BBC in January 1946. His remarkable broadcasting career spanned 48 years and made him a household name as a cricket commentator and on programmes such as In Town Tonight and Down Your Way. Barry Johnston has had exclusive access to his father’s letters and has interviewed dozens of his friends and colleagues to offer the full story of the man behind the microphone. It includes his controversial sacking from television and his re-emergence as a much-loved figure on Test Match Special. A Further Slice of Johnners. 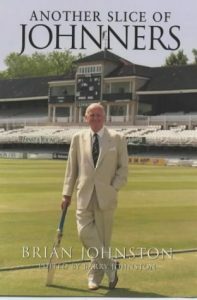 In this third and final anthology in the popular Slice of Johnners series, Barry Johnston has edited highlights from three more of his father’s books, It’s Been A Lot of Fun, Brian Johnston’s Down Your Way and More Views From The Boundary. This anthology covers Brian’s early days, from his childhood in Hertfordshire, his school days at Eton and Oxford, his job in the family coffee business in the City and his service with the Grenadier Guards during World War Two. There is also a selection of the most memorable characters and locations from his fifteen years on the Radio Four programme Down Your Way. 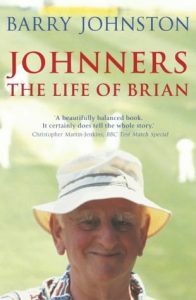 Finally there is a collection of Brians ‘View From The Boundary’ interviews on Test Match Special, including conversations with Eric Idle, John Major and Peter O’Toole.